Fifty-five hearty souls converged in the North Parking Lot at Mystic Seaport on Saturday, April 1, 2017 for the SNEC Spring Workshop. I say “hearty” as the weather was rainy, raw and extremely windy! You would have thought we were in the middle of January and not April 1st. Our workshop started with a self-guided tour of the Watercraft Building. This building houses an extensive collection of vintage motors and boats not currently being displayed in the museum proper. Everyone was on their own to meander throughout the building, take pictures and ask questions. Our members were free to go into the seaport proper and walk around looking at the exhibits – especially the new exhibition hall located across the street from the North Parking lot. This was a fascinating place with many beautiful artifacts and a self-guided tour. From there we had an enjoyable lunch at Latitude 41 where it was nice and warm and we got to converse with old friends and many new chapter members. Chapter President Lynn McFarlin welcomed everyone and expressed her appreciation for the turnout in such conditions! After lunch we walked over to the Mayflower II, owned by the Pilmoth Plantation, and is currently undergoing a multi-year restoration in the Henry B. duPont Preservation Shipyard at the seaport. The restoration of the nearly 60 year old wooden ship is being carried out over several years with the project scheduled for completion in 2019. The purpose is to prepare the ship for the 400th anniversary in 2020 of the Pilgrims’ arrival in 1620. We were able to go walk around the ship, climb the stairs to the upper decks and see the restoration work “up close and personal”. We thank Dana Hewston, Quentin Snediker, Whit Perry and Matt Barnes (SNEC chapter member) for taking our questions and explain about the restoration. In addition to the Mayflower II, the Viking longship Draken Harald Harfagre was hauled out on March 31st for several days of routine maintenance. The vessel has been spending the winter at Mystic Seaport after her 2016 expedition to North America from Norway. The Draken is a reconstruction of what the Norse Sagas refer to as a “Great Ship”. This was a beautiful ship and we were fortunate to be able to see her! 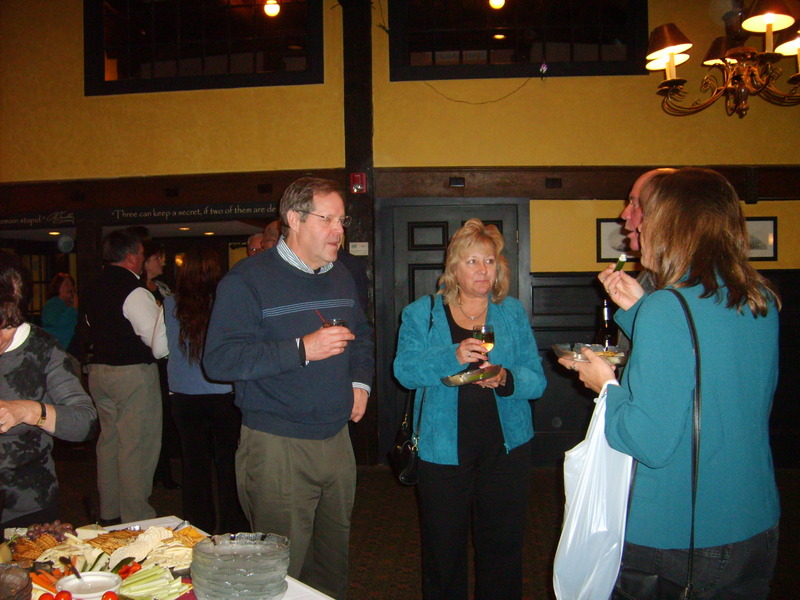 On Saturday November 19th, 40 SNEC chapter members gathered at Gaetano’s Tavern on Main in Wallingford, for our annual dinner. Everyone was glad to see that Chris and Corrine Johnson were able to make the dinner and that Chris was coming along very well after his recent illness. 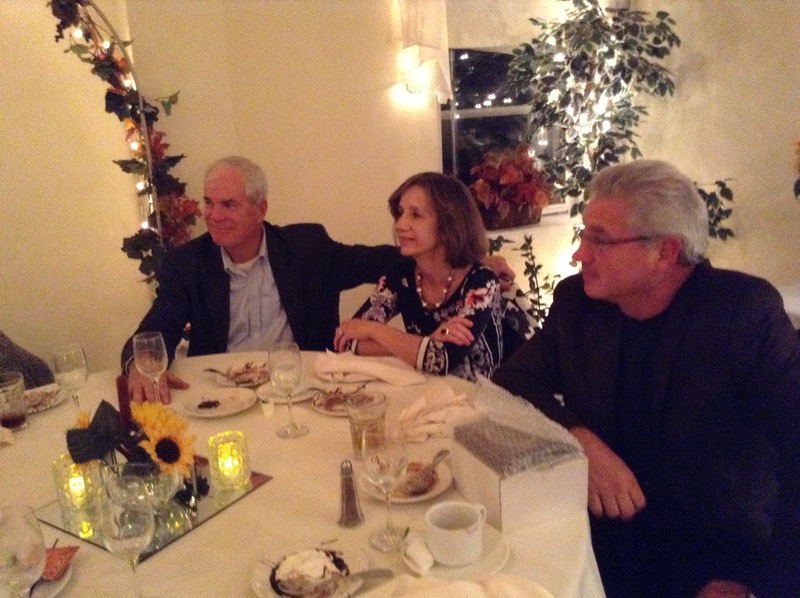 The appetizers were great and as usual, Gaetano’s did an excellent job with our buffet dinner – there was something for everyone! The ice cream cake roll topped off the meal. Chapter President Steve Haines thanked everyone for coming and gave a brief overview of the chapter financial – the chapter is in good financial condition, our July 2016 boat show as well as the great workshop that we had at Jim Murdoch’s in the early Spring. Steve advised the group that he would be stepping down as Chapter President due to his work schedule and that Lynn McFarlin had agreed to step into the President’s spot. In addition to Lynn being President, she will also continue to be Boat Show Chair as well as taking care of the boat show registrations. Steve introduced the proposed board for 2017 as follows: Officers: Lynn McFarlin, President, Ed Dombroskas, Vice President, Rob Bamberg Treasurer, and Bette Heinzman, Secretary; Board of Directors: Cliff McGuire, Wes Van Dine, Katie Haines, Mike Sorensen, Rob Sutton, Gail Van Dine, Katlyn Conkey, David McFarlin, Chris Johnson, Lee Heinzman and the (3) new board members, Rich Rosselli, Chris Enger and Andrew Robb. A vote was taken and the 2017 officers and board were approved unanimously. Steve also mentioned that we were looking to change our name from Mahogany Memories to something that would reflect both wooden boats as well as classic fiberglass. More on this soon. Each year the Chapter President gets the honor of presenting the “President’s Cup” to someone in the Chapter who has helped to increase the visibility of the chapter and for 2016, Steve presented the Presidents Cup to Lynn McFarlin. Lynn thanked everyone for attending the dinner and reiterated what Steve had said about a name change. She also advised that we were looking into doing a workshop at Mystic in the Spring as the Mayflower is there being refurbished and that we would advise a date just as soon as we had more information. 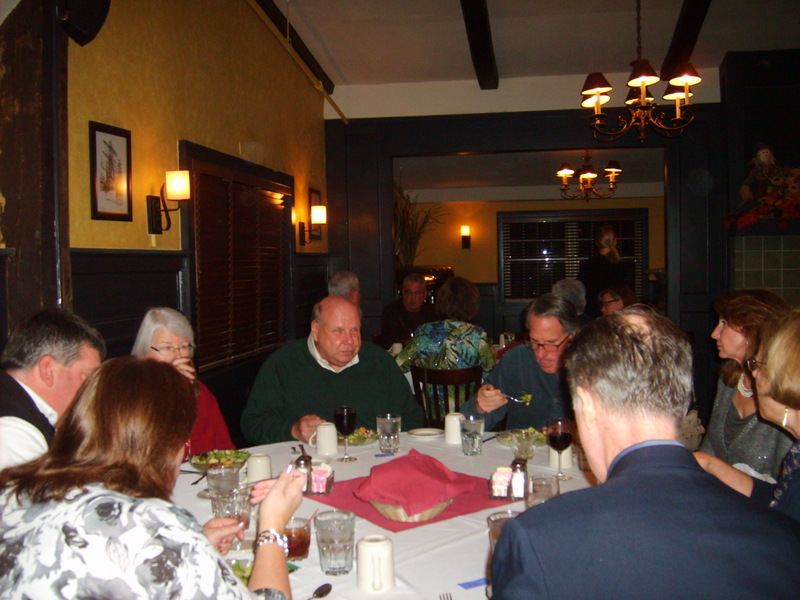 Our Annual Dinner took place on November 17th at J.Timothy’s Tavern in Plainville, CT. The weather cooperated and I was pleased to see that we had 42 people attending. IT was nice to see a number of newer members and I thank Chris Johnson (and Corrine) for all of their assistance in putting cocktail hour and dinner together. I am pleased to say that we have booked J. Timothy’s for our 29th Annual Dinner on Saturday November 23rd, 2013.